Over 4,000 visitors attended this, the first Exhibition of Red Line Art Works. It took place in the UNESCO World Heritage City of Bath in the U.K from 24th May to 9th June 2013. The thirty five Exhibited works included pieces from : Russia, Germany, Italy, Romania, U.S.A. and the U.K. These included paintings, digital artwork, sculptures, posters, photos, etc. 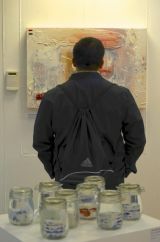 Many were being Exhibited for the first time. You can read a Review of the Exhibition (by Ieva Lakute for 'Thunk!') here. Written Comments left by visitors to the Exhibition are here. 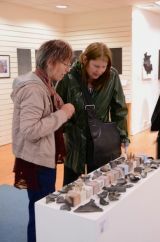 The Exhibition was part of Fringe Arts Bath's annual visual arts Festival.